322 pages | 29 Color Illus. | 83 B/W Illus. This book provides a comprehensive overview of the use of noble metal nanoparticles for bioimaging and biosensing. It starts with a review on the synthesis, characterization, optical properties, and bioconjugation of noble metal nanoparticles, followed by introduction of various biodetection techniques based on noble metal nanoparticles. In between these topics, microfabrication of biosensing chips and the use of microfluidics to enhance biosensing performance are discussed. "This book presents an extensive collection covering topics ranging from the fundamental principles of noble metal nanoparticles to their versatile bioapplications. It provides a deep insight into the multidisciplinary approach of noble metal nanoparticles in bioimaging and biosensing, especially for young scientists seeking inspiration from cutting-edge technologies all over the world." 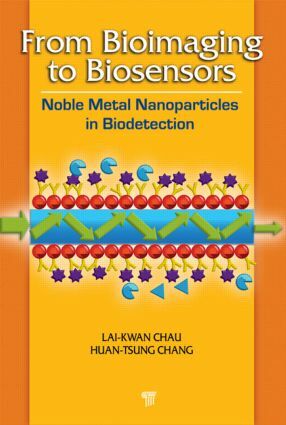 "This book offers timely reviews of the exciting and emerging field of noble metal nanoparticles and their applications in biodetection. It will benefit scientists in the field who want to keep abreast of the state of the art, graduate students who want to learn the subject, and engineers or doctors who want to apply the methods in their practice." Chau Lai-Kwan did his BSc in chemistry from The Chinese University of Hong Kong, Hong Kong, in 1980, MSc in chemistry from the University of Houston, Texas, in 1984, and PhD in analytical chemistry from Iowa State University, Iowa, in 1990. From 1990 to 1994, he worked as an assistant research scientist in the Department of Chemistry, University of Arizona. From 1994 to 1995, he worked at the Center of Bioengineering, University of Washington as a senior fellow. He joined the faculty of the Department of Chemistry and Biochemistry, National Chung Cheng University, Taiwan, in 1995 and became a professor in 2003. Currently, he is also the director of the Center for Nano Bio-Detection, National Chung Cheng University. His research interests cover biosensors, analytical chemistry, and nanomaterials. He developed the fiber-optic localized plasmon resonance biosensing platform and received Taiwan’s 2008 Nano-Tech Award.